Fall weather is definitely coming, and while it hasn’t hit the bay area just yet, I’m definitely planning on some chilly weather in the very near future. Karl the Fog is creeping up on the San Francisco coast and I can’t wait for the cool weather to roll in so I can pull out my boots and coziest leggings. While the weather is still a bit warm, I’m planning ahead to make sure I’ve got everything I need to keep me warm when it’s starts to get cold. This means LOTS and LOTS of flannel shirts. It’s the perfect cosy staple shirt for those fall and winter mornings when you don’t want to get out of bed and you can’t find anything to wear in your wardrobe. I definitely have had my fair share of those. Check out some of my favorite fall flannel favorites below and start stocking up! 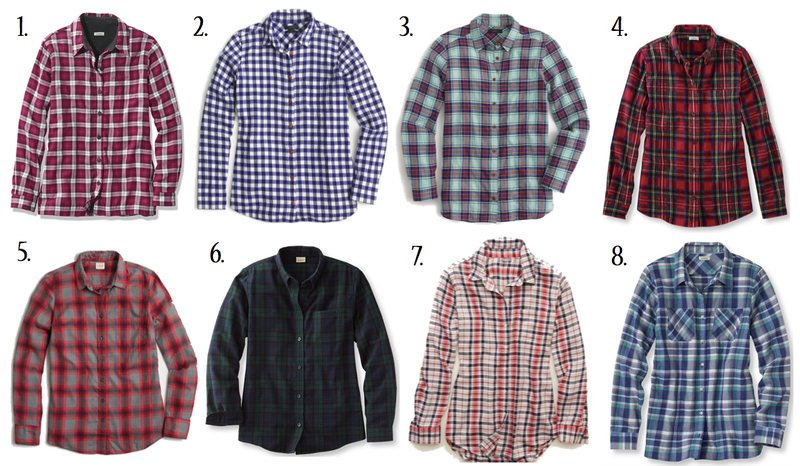 Have a favorite flannel? Share with me in the comments below! I love this! I think I need #7 in my life stat. I am obsessed with flannel and wear it all fall and winter long! I love red or blue toned flannel shirts and if you can get away with it…I like getting a gender neutral shirt from the men's department which is better quality than the thin women's flannel shirts! I need to make number 4 mine! I love rich red check prints like this, and I also prefer to get mens shirts when wearing flannel – they sit nicer and look better with leggings and boots! I just bought the best flannel from Madewell and I'm so excited! Love all of these! I saw the cutest flannel shirt from Nordstrom–it has studs on the collar!